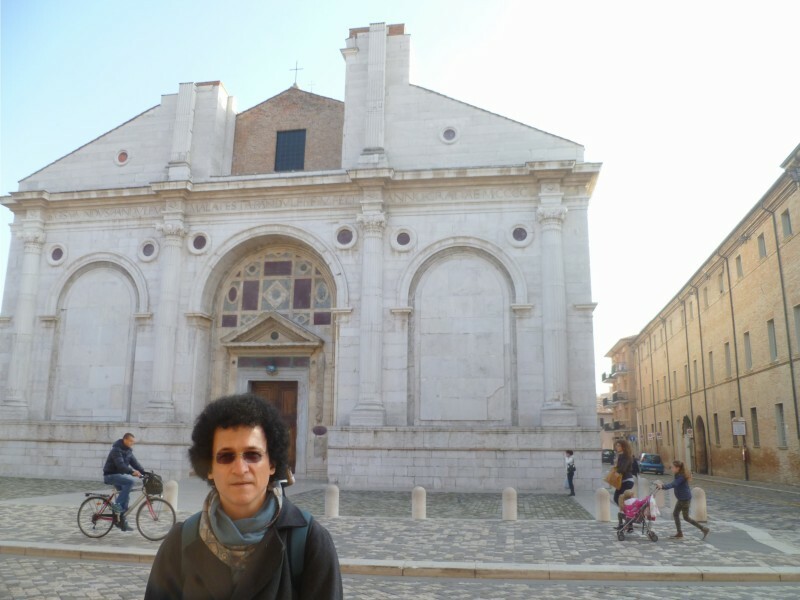 I had it all planned: we were in route from Florence to Urbino , and we would jump off the train for a few hours in Rimini to visit Alberti’s Tempio Malatestiano. HOB and I were in the midst of our self-designed Ideal City trip across Italy. Were studying the work of five Renaissance architects/urban planners: Brunelleschi, Bramante, Alberti, Michelangelo and Palladio. 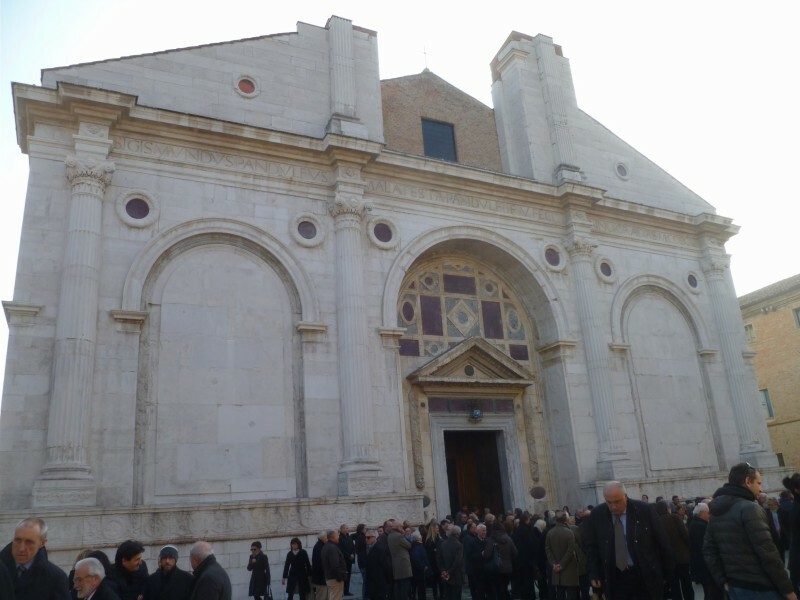 Our destination in Rimini was Tempio Malatestiano, a church remodeled by Leon Battista Alberti in the 1450’s. You’ve heard the term Renaissance Man? Well, Alberti was the Renaissance Dude. He wrote about math, artistic perceptive, and philosophy and was one of the first people to study ancient ruins and buildings. In true spirit of the Renaissance, he incorporated what he learned from ancient buildings into his own architectural designs. 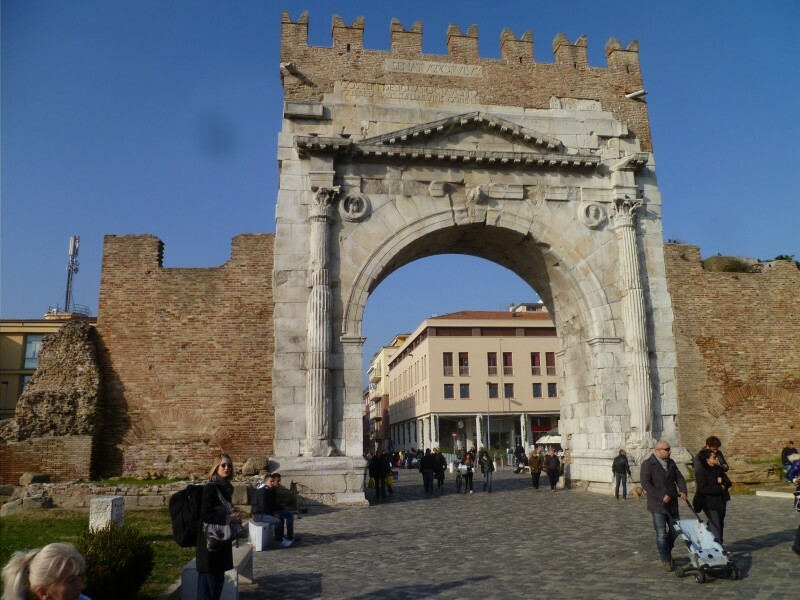 In fact, a major influence for the doorway of Tempio Malatestiano is close by in Rimini–the Roman era Arch of Augustus. So anyway, we got off the train and rushed to the church…….aaaannd it was closed for a funeral. That’s the magic (and occasional frustration) of seeing art in situ: these places are real living institutions. In this case, a functioning church for hundred of years. But no worries–this gave us extra time to study the exterior, and visit the nearby Arch of Augustus, and find a bakery with a handy public restroom. Time to get back on to the train. Funeral at Tempio Malatestiano. RIP whoever you are…. The Arch of Augustus (27 BC), a short walk from Tempio Malatestiano and an inspiration for Alberti’s design for the chuch front and doorway. This is the first church ever to use the triumphal arch as a structural element. Side view of Tempio Malatestiano which are meant to look like Roman aqueducts. 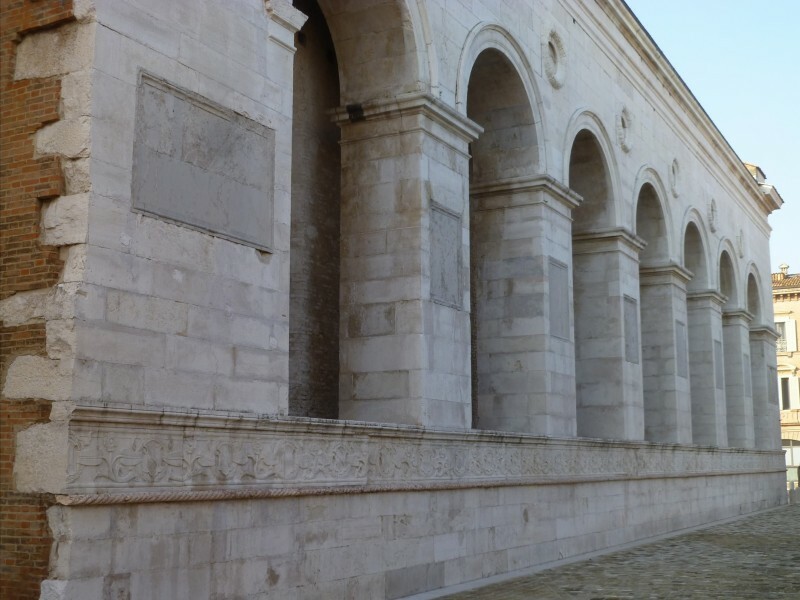 You can see how Alberti added the marble facade over the original brick building when he renovated.